The EuroMillions iPhone and iPad app is available for download direct to your iPhone, iPad or iPod via iTunes. You can choose your EuroMillions numbers, get the most recent results, browse through historical results and even check your tickets! The app is updated seconds after each EuroMillions draw takes place so that you can get the most up-to-date information whenever you want and wherever you are. Tap the iTunes download link on your device. The most recent winning EuroMillions numbers are updated on the app shortly after each draw, so you never have to wait around to find out if you’ve won a prize! Whether you play EuroMillions on Tuesdays, Fridays or both, you’ll be the first to know about the winning numbers with the new Notifications Centre. You can set local reminders to pick your numbers for the next draw and choose push notifications that tell you about special draws or when the jackpot has rolled over a certain number of times or reached a certain amount. Full breakdowns showing the value of each prize in pounds or Euro are available on the app shortly after the winning numbers are posted. In addition to discovering how much each prize is worth, you’ll also be able to find out how many people won in each prize tier and whether or not the jackpot rolled over. The Multi-Line Ticket Checker saves multiple entries and checks them against the most recent results, which is a great option for syndicates and those who play multiple tickets in every draw. You’ll see any prizes won on each ticket as well as the total amount won from all the lines you entered. You can also exclude your tickets from draws in which you don’t play. If you don’t want to choose your own numbers to play, you can use the Number Generator to create a random line that you can enter into the next EuroMillions draw for the chance to win big. You can browse through the archived EuroMillions results section to see winning numbers and results going all the way back to the first draw in February 2004. Easily join an online EuroMillions syndicate for the next draw from your iOS device. Entries are stored in an online account and you will be notified of any winnings. 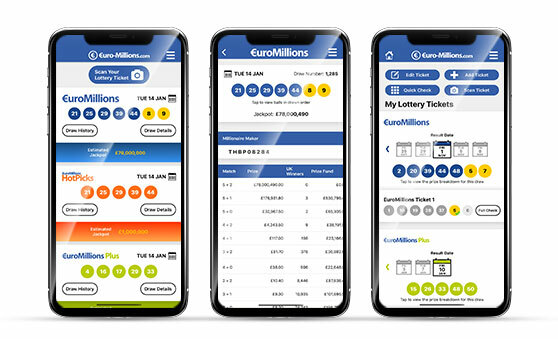 The EuroMillions iPhone or iPad app is offered in English, Chinese, French, German, Italian, Polish, Portuguese, Russian, Spanish and Swedish. The EuroMillions App is compatible with all iPhone, iPad and iPod devices using iOS 7.1 or higher. If you are looking for help using the EuroMillions app visit our EuroMillions iPhone help page.